Union Pacific Locomotive 4141 will transport the remains of President George H.W. Bush, along with his family and friends, from Spring to College Station. He will be buried at his presidential library at Texas A&M University. Union Pacific made the locomotive in Bush's honor and unveiled it near his library as part of an exhibition in 2005. The two-locomotive, 11-car train will leave around 1:15 p.m. CT on Thursday and arrive in College Station about 2 1/2 hours later. "We'll be moving at a pretty modest speed," said Brenda Mainwaring, assistant vice president of public affairs at Union Pacific. "We want to make sure that the people who have taken the time to line the route to pay their respects have the opportunity to do that." 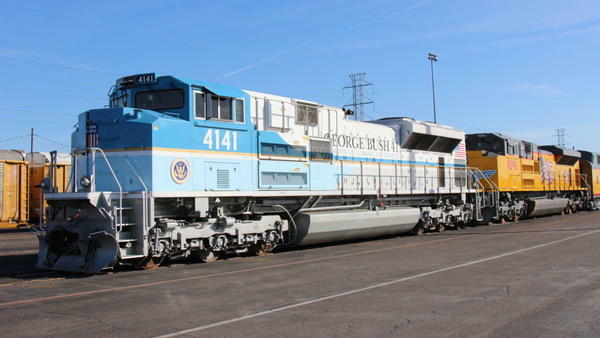 The train has the presidential seal, the words "George Bush 41 Presidential Library and Museum" printed along its side and is painted like the presidential airplane, Air Force One. Since 2005, the train has been at work across the country. "It's not just for show," Mainwaring said. "Every locomotive has to pay its own way on the Union Pacific. All of our locomotives haul freight, this one has hauled its share of freight as well. We operate in 23 Western states, so it has been all over the Western United States." So why did Bush decide to take his final journey on a train – the first president since Dwight D. Eisenhower in 1969 to do so? Mainwaring said Bush was very involved with the railroad and that he used to talk about fond memories he had traveling with his family on trains. "I think because of those very fond memories," she said. "But I think it was also because he knows that this route, and traveling by train, allows him to travel through the countryside that he loved so much between Houston and College Station and allow all those people who live along the route to pay their own tribute." Copyright 2018 Houston Public Media News 88.7. To see more, visit Houston Public Media News 88.7. The connection Texas House Speaker Joe Straus shares with the 41st president goes back decades. He worked for Vice President George H.W. Bush, and then again when Bush entered the Oval Office.